Written for The Solute’s Forgotbusters series, edited by Sam Scott. The name “Busby Berkeley” is practically synonymous with the extravagant Hollywood musicals of the Depression era. For about fifteen years, Berkeley was the king of the musical, serving as the choreographer and sometimes director of lavish song-and-dance films, as his geometric, intricate dances often served as the highlights of the somewhat standard backstage dramas that typified the Hollywood musical of that time. Indeed, it was not until the rise of the Freed Unit, with its own iconic musicals such as Singin’ in the Rain and The Band Wagon, that the musical numbers became more integrated into the narrative instead of being largely confined to the stage. Berkeley is perhaps best known today for the famous films he choreographed for other directors at Warner Bros., such as 42nd Street, Gold Diggers of 1933, and Footlight Parade. These films were all made in 1933, and slowly Berkeley’s brand of extravagance became less popular, as he even made forays into straight drama. Thus, the late-career masterpiece that is The Gang’s All Here is even more unexpected. The Gang’s All Here was made in 1943, in the middle of World War II, and it stands out for a number of reasons. First, and perhaps most importantly, it was the first color film that Berkeley had directed or even worked extensively on, and stunningly he shows no sign of tentativeness, lavishly and liberally using the fantastical Technicolor to render the both the songs and the narrative sequences in strong hues that add a vital amount of character to the images. Secondly, he was the sole director of the film, and while this may not have altered too much, it gives The Gang’s All Here a more cohesive approach than something like 42nd Street (the only other Berkeley movie I have seen); the aesthetic approach is very similar in most of the scenes and there is an abundance of performances that occur even during the narrative sections. The plot of The Gang’s All Here is relatively straightforward, relying more on the character interactions than any sense of drama or urgency. The film begins in the Club New Yorker, known for its lavish and wild shows featuring Phil Baker (Phil Baker) and Dorita (Carmen Miranda), as it introduces the de facto protagonist Andy Mason (James Ellison), an Army sergeant about to leave for the Pacific Front. He sees and then meets Eadie Allen (Alice Faye), a new dancer at the Club, and they quickly fall in love. He leaves the next day, and is allowed to return home after receiving a medal. Upon receiving this news, Andrew Mason Sr., his father (Eugene Pallette) decides to throw a party when his son returns/ And, after a series of deliberations, he invites the performers at the Club New Yorker and the Benny Goodman Orchestra (as themselves) to stay at his and his colleague’s homes while they rehearse for a new show and frames the party as a war bond rally. From here, the film splits into a surprisingly complex number of sub-plots, the most relevant being the Andy’s desire to marry Eadie even though he is betrothed to Potter’s daughter Vivian, but by the film’s closing party, as everyone is reconciled. It is a pleasurable story, to be sure, and some parts become truly emotional (especially Eadie’s loneliness at Andy’s absence), but it is by and large an excuse for the musical sequences that grow more and more strange, culminating in perhaps the most profoundly odd 5 minutes I have ever seen in any film. Shall we begin? The very first shot is a marvel, beginning with a shadowed figure singing “Aquarela do Brasil” (yes, the song from Terry Gilliam’s Brazil). 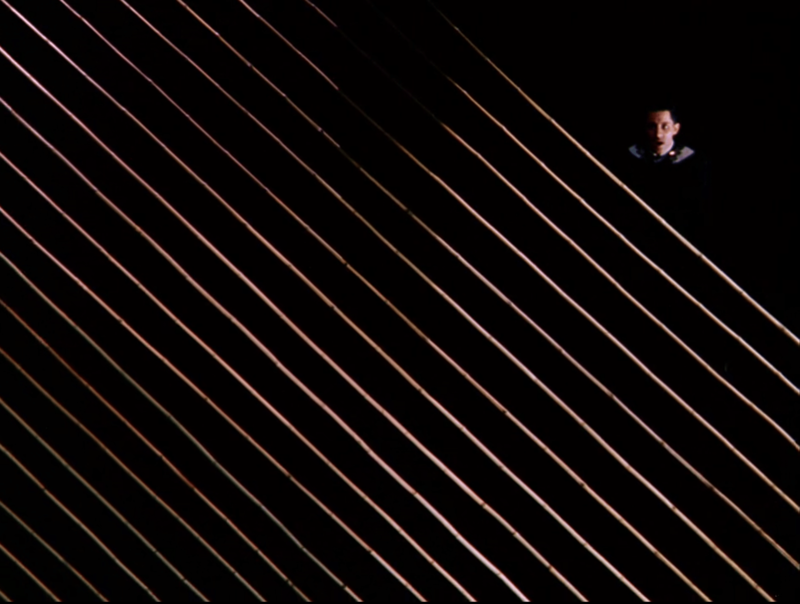 The camera zooms in, and then moves down an inexplicably abstract pattern of lines before settling on a boat from Brazil carrying both passengers and cargo. The camera pans up an improbably large bundle of fruit and back down to reveal Dorida, who begins singing as the camera moves over to Phil Baker, then through the proscenium to reveal the entirety of the audience. And that’s all just in the first shot. To describe the extent of the ingenuity of The Gang’s All Here, or to just describe each musical number in an acceptable amount of detail, would take several articles. Berkeley’s approach here is less in line with the strict theatricality of something like 42nd Street, where an explicit narrative is being told, and more in terms of a free-associativity, where the performance is embraced for the performance’s sake. From an utterly inexplicable number featuring a long line of chorus girls wielding giant bananas to a simple performance on the Staten Island ferry by Eadie to Andy (that features the fourth-wall breaking exchange, “Hear the orchestra?” “Where’s it coming from?”), to the second-to-last number, featuring heretofore unseen young children dancing in polka-dot dresses, scenes that would normally be incredibly disruptive and extraneous in an ordinary film are the most important, as Berkeley constructs a celebration of creativity and art that is never less than a joy to watch. But the most surprising aspect of The Gang’s All Here is the ending, which quite literally comes out of nowhere. 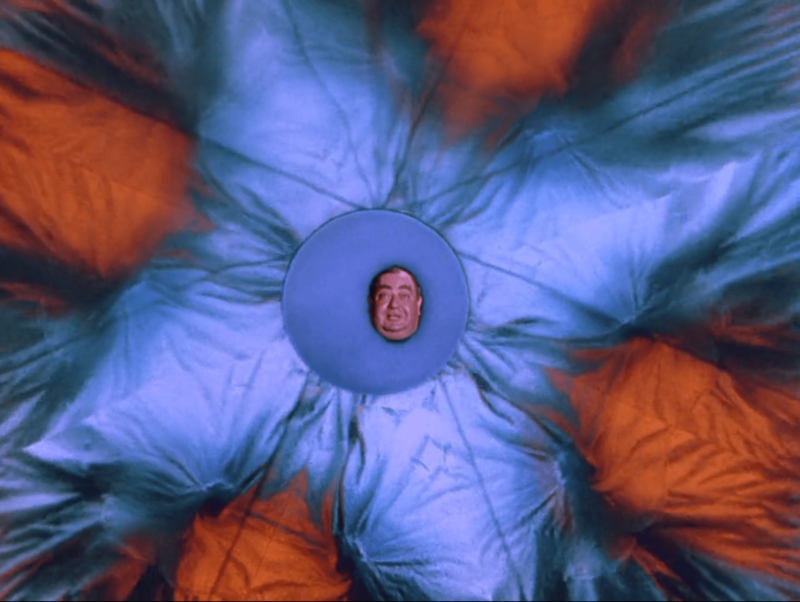 After a brief segment of the performers with lighted, floating hoops while wearing what look like space suits the film literalizes the kaleidoscopic effect that Berkeley had received acclaim for, turning the dance into completely abstract images, before the faces of all the principal players zoom out of the screen and the heads of the entire cast sings in unison. It is an eerie, almost scary effect, one that would shock almost any viewer. How then, can such a profoundly weird film be forgotten? 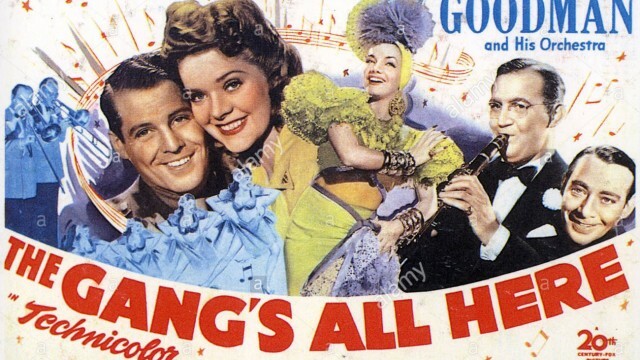 Most likely, The Gang’s All Here was probably dismissed as “just another” Hollywood musical, and it likely is about as famous as any other famous-at-the-time film from that era. But Berkeley’s accomplishment speaks for itself; he once said that his main goal was to top himself, and here, at the end of his heyday, he made a musical film that shares more qualities with the avant-garde than anything else, even the musicals which he had done so much to popularize. Prompted by the occasion of Kiarostami’s passing, an attempt to chronicle some measure of the development of my cinephilia. An even more stream-of-consciousness post than usual. It must be said that, especially before the first wave or phase of my cinephilia, I retain random, often off-color memories from bad movies that I happened to watch; hopefully these will fade eventually. Perhaps inevitably, most of my favorites are in here, though important films/probable former first-place favorites to me, like Raiders of the Lost Ark and Back to the Future, are not. First Wave of Cinephilia (summer of 2013?) 2001: A Space Odyssey, City Lights, The Godfather, The Godfather Part II, Blade Runner, Citizen Kane, The Searchers, Raging Bull, Vertigo, North By Northwest, The Deer Hunter(? ): some mixed reactions from this time; e.g. distinctly remember being awed by 2001, though not to the extent I am now, while my mother and sister fell asleep, and was somewhat underwhelmed by most of the latter half; kind of happy that this wave ended quickly, wasn’t nearly invested enough to truly engage with the films. From these films, Blade Runner was probably formative; remained my favorite film for an extended time and I truly was in awe of the soulful spectacle. Autumn Semester Break Weekend 2015 (January 29-February 2) Breathless, Chinatown, La jetée, Badlands, 8 1/2, Night and Fog, The 400 Blows, Seven Samurai, Singin’ in the Rain, Casablanca, Sunrise, Tokyo Story: pretty sure that this is the weekend that restarted my cinephilia; must credit They Shoot Pictures, Don’t They for making me aware of people like Tarkovsky (and, memorably, Salo), but I don’t think it really clicked in a sense deeper than a film like Apocalypse Now until that weekend; mostly on an emotional level then but I still remember certain moments, like the marsh tracking shot and the city zoom in Sunrise, that struck me on a technical level even then. The Battle of Algiers, Close-Up (first half of 2015, June 25): if I can call any two films formative before I started Letterboxd, it would be these two (maybe discounting 400, Sunrise, Tokyo Story). It helps that I saw these at relatively isolated points, and though I remember seeing various films like Vivre sa vie, La dolce vita, and L’avventura distinctly on their own, these two were the ones that especially stood out, Battle for how boldly political it was (especially at a time when I was staunchly conservative) and Close-Up for its heartbreaking celebration of cinephilia; I was aware of the various techniques of both but they swept me up with such gusto, such awe. Eraserhead (midnight June 6, 2015): this is my B.C./A.D. The visceral impact, the technical perfection, the pure nightmarish quality shook me to my core. I saw Mad Max: Fury Road later that day and was underwhelmed because of how profoundly affected I was at the time. Sans soleil: if Close-Up is the must-see film for cinephiles, then Sans soleil is the must-see film for any living person; I remember I started to watch it but was interrupted 15 minutes in by my dad, who wanted to watch Kingsman (we both hated it); I restarted the next day and was destroyed and rebuilt. Days of Heaven: don’t know why I chose to restart my Letterboxd (which had lain dormant with only one diary entry for Moonrise Kingdom, I think on April 18?) with this, but perhaps the move to Georgia emboldened me to usher in a new stage; last film I saw before was Grave of the Fireflies on the plane. Jeanne Dielman/Persona: a bit unsure on these but I think these two, especially Jeanne Dielman, inform my sensibilities to a strong extent; both two immensely formal and daring works that shocked me to no end. Yi Yi: I could put just the camera move on Ting-Ting when she’s taking out the trash on this list and it would suffice, it was such a revelatory use of simple but pure camera movement to convey a sense of humanism, of emotion that put me in a true state of awe. The crosscutting between the first date and the reminisces was similarly revelatory, but everything felt so alive yet so precise; just so . Queen of Earth: I remember being surprised that, in a day of seeing (and meeting!) Wenders and Melville that this film by a director I had heard little about was the best I saw. I wouldn’t necessarily stand by this statement now, but I’m fairly certain that this was the first truly independent film, and was an important step for me to rely slightly less on the canon.